Place the patient in a semi-recumbent position, or in a dental/ENT chair, if available. Apply topical anesthesia if desired. 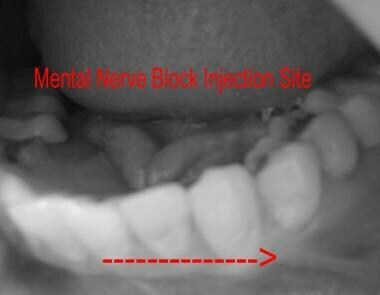 Mental nerve block injection site. The mental nerve block provides anesthesia only to the lower lip and soft tissue of the chin. It does not anesthetize the teeth, which would require an inferior alveolar nerve block. If the foramen is not directly palpable, the anesthetic can be injected into the buccal mucosa between the 2 lower premolar teeth. Never inject into the foramen, as this can permanently damage the neurovascular bundle. Ultrasound can help identify the mental foramen, especially in the novice operator. A dental aspirating syringe with a dental carpule can be used in place of a regular syringe. Slide the carpule into the syringe and place the needle on the end. Place a linear ultrasound probe in the transverse orientation over the inferior portion of the mandible at the level of the second premolar. 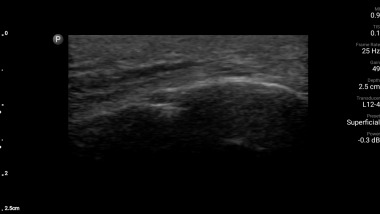 Bone will appear as a hyperechoic linear structure on the ultrasound image. Scan cephalad until a hypoechoic cleft appears; this is the mental foramen (ultrasound image). Mental foramen typically appears below the second premolars. Aspirate and inject as outlined above. The image below shows an ultrasound-guided mental nerve block. 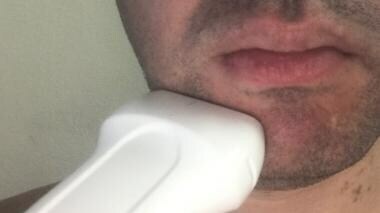 Part A shows how the transducer should be positioned to obtain an adequate image. Mental nerve foramen localization with a high-frequency ultrasound probe. Part B highlights the mental foramen, which appears as a hypoechoic cleft. Transverse view of the mental foramen in the mid-position of the image. Ultrasound of mental foramen (arrow). 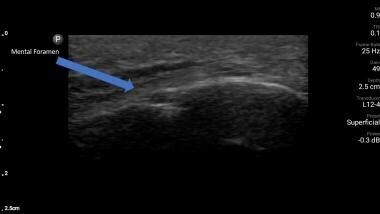 Ultrasound may be used dynamically to watch spread of anesthesic or to guide the area where needle should be guided. Kaufman E, Epstein JB, Naveh E, Gorsky M, Gross A, Cohen G. A survey of pain, pressure, and discomfort induced by commonly used oral local anesthesia injections. Anesth Prog. Winter 2005. 52(4):122-7. [Medline]. Salam, G MD, DO. Regional Anesthesia for Office Procedures Part I Head and Neck Surgeries. American Family Physician. 2/2004. 69:585-590. [Full Text]. Park HG, Park PG, Kim WJ, Park YH, Kang H, Baek CW, et al. Ultrasound-assisted mental nerve block and pulsed radiofrequency treatment for intractable postherpetic neuralgia: three case studies. Korean J Pain. 2014 Jan. 27(1):81-5. [Medline]. [Full Text]. Jaber A, Whitworth JM, Corbett IP, Al-Baqshi B, Jauhar S, Meechan JG. Effect of massage on the efficacy of the mental and incisive nerve block. Anesth Prog. 2013 Spring. 60(1):15-20. [Medline]. [Full Text]. Thomson CJ, Lalonde DH. Randomized double-blind comparison of duration of anesthesia among three commonly used agents in digital nerve block. Plast Reconstr Surg. Aug 2006. 118(2):429-32. [Medline]. Mesgarzadeh AH, Afsari H, Pourkhamne S, Shahamfar M. Efficacy of bilateral mental nerve block with bupivacaine for postoperative pain control in mandibular parasymphysis fractures. J Dent Res Dent Clin Dent Prospects. 2014 Summer. 8(3):172-5. [Medline]. [Full Text]. Syverud SA, Jenkins JM, Schwab RA, Lynch MT, Knoop K, Trott A. A comparative study of the percutaneous versus intraoral technique for mental nerve block. Acad Emerg Med. Nov-Dec. 1(6):509-13. [Medline]. Yesilyurt H, Aydinlioglu A, Kavakli A, et al. Local differences in the position of the mental foramen. Folia Morphol (Warsz). 2008 Feb. 67(1):32-5. [Medline]. Whitworth JM, Kanaa MD, Corbett IP, Meechan JG. Influence of injection speed on the effectiveness of incisive/mental nerve block: a randomized, controlled, double-blind study in adult volunteers. J Endod. Oct 2007. 33(10):1149-54. [Medline]. Hae Gyun Park, Pyung Gul Park, Won Joong Kim, Yong Hee Park, Hyun Kang, Chong Wha Baek, et al. Ultrasound-assisted mental nerve block and pulsed radiofrequency treatment for intractable postherpetic neuralgia: three case studies. Korean Journal of Pain. January 2014. 27:81-85. Region of anesthesia (side view). Region of anesthesia (front view).